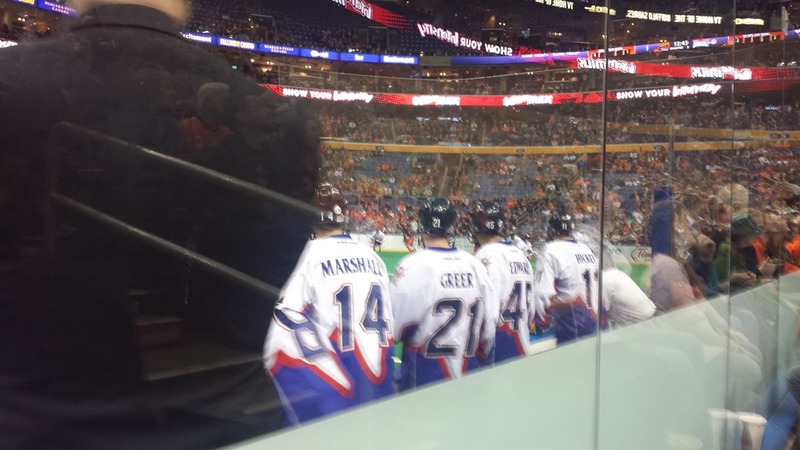 If you’re a Bandits fan, a Rock fan, or just a fan of the game, this was a great weekend to watch the NLL. The Bandits and Rock played back to back games on Friday and Saturday nights, and as expected, both games were close, exciting, chippy, and very entertaining. I got to both of these games but didn’t do a separate game report for Friday night’s matchup for reasons I’ll get to. This article will serve as a game report for both. I decided to bring my kids to Friday’s game in Buffalo so I messaged my buddy Steve Bermel to see if he could get me tickets. He’s done this for me in the past and gave me hell once because I bought tickets through the box office (and therefore paid full price plus fees rather than Steve’s season ticket holder discount price). Steve called me back and said that Kevin Kennedy, the Bandits anthem singer, wasn’t using his tickets for that game and had donated them to me and my boys. These tickets were “row 3, behind the Rock bench” as Steve put it, so I was excited about sitting only a few rows back from the bench. It turns out that row 3 is the row directly behind the Rock bench, so we we right in the action. This was as close as I’ve ever been to a sporting event (except a spring training Blue Jays game where I was sitting behind home plate, next to the guy with the radar gun) so that was very cool, and my boys really enjoyed it as well. We were close enough to see that Blaine Manning has a mole on the back of his head. The more you know. Sitting so close had some advantages: we could see that the Rock have a special stick they use for face-offs. Whenever a player went to take a face-off or came off the floor after one, they’d swap their regular stick with the face-off one. Nicky got high-fives from most of the Rock players as they came out for the second half, and one of the Rock employees gave them each a ball after the pre-game shoot-around. I could hear Brett Hickey trying to get the team fired up (“Come on guys, let’s do this. Let’s go”) as they took the floor before the game and after halftime, as well as when they left the floor just before halftime. I’m more impressed with that guy after every game and thanks again to the Vancouver Stealth for releasing him. But sitting so close has some drawbacks too, the main one being that we couldn’t see the game. The players and coaches never sit down during the game (and I wouldn’t expect them to), so we ended up watching play at the far end on the Jumbotron (see the picture above for our actual view of the far end) and play at the near end through a maze of players. During the 1st and 3rd quarters, we were staring at Dan Ladouceur’s back (picture at right) and during the 2nd and 4th it was Blaine Manning’s. As for the game itself, I honestly couldn’t see enough of it to have a good opinion on how the teams played. I thought the Rock offense looked kind of haphazard in the first. They didn’t seem to be getting many good looks and their ball movement wasn’t great. It was better in the second half. Cosmo played well and Rose was pretty good with flashes of greatness here and there. Hey, remember that game where Mark Steenhuis didn’t play very well and didn’t seem to be trying very hard? No, me neither. That man’s only playing styles are HARD and HARDER. The end of game 1 was beyond chippy. At one point, Troy Cordingley was yelling at John Lovell and had to be physically restrained from leaving the Bandits bench. Brodie Merrill came back to the Rock bench near the end of the 4th and literally punched the wall in front of the bench three times. Good hard punches too. I don’t know what he was so pissed about, but on his next shift, he fought Steve Priolo and was tossed from the game. Then a couple of other fights started as well, and it looked like it was going to get out of hand, but it stopped just short of that. The game eventually ended and the players lined up for the handshakes. Brodie’s brother Patrick Merrill led the line for the Rock, and the teams went through the line just fine until the Rock got to Cordingley who immediately started yelling at Merrill (“F**K YOU” was clearly the take-home message for Merrill here) and once again had to be pulled away by his team. It seemed like a typical Bandits “We’re losing so let’s start some fights” move, except that the Bandits weren’t losing. Again, I couldn’t really see much so I don’t know how the fights started or what Cordingley was so mad about. Fast-forward almost 24 hours, and both teams are at the ACC in Toronto for the rematch. I was in my regular seats for this one, so I have a better idea of who played well and who didn’t. Answer: the goalies played well, the offenses not so much. This started off looking like it was going to be a repeat of the previous night’s game. There were penalties all over the place including a fight. I imagine the refs were just waiting for Priolo and Hostrawser to go at it so when each gave the other a couple of shoves, the refs sent them off for roughing. I didn’t think penalties were warranted here and I guess Priolo wondered the same thing out loud since he got an extra 2 for unsportsmanlike conduct. There were a few other incidents where players were almost looking for penalties. Hostrawser hit a Bandit with a full crosscheck right across the back, knocking him down, in full view of the ref with no call. Mark Steenhuis got a penalty early in the second but when they showed the replay of why he got the penalty, you got a good view of a Rock player punching Ryan Benesch in the side of the head. Someone slashed Kedoh Hill who waited a second before falling down. My son said it looked like a soccer play but the slash was called and not the dive. One of the best plays of the game (and penalties were neither called nor deserved on this one) was Billy Dee Smith racing down on an almost-breakaway and then deciding that rather than trying to deke or shoot around Rob Marshall he’d just go straight through him. Both players are 6’3″ but Smith has 35 pounds on Marshall. But Marshall lowered his shoulder at just the right time and while he did get knocked over, Smith went down too and the Rock recovered the loosie. I don’t know if the coaches were warned by the refs at halftime or if they both decided to just drop all that revenge crap and play lacrosse instead, but the second half wasn’t chippy at all and it turned into a great game. The Rock were up by 3 going into halftime but Toronto’s offense came out flat in the third for their first scoreless quarter of the season. Just like part of the previous night, the Rock couldn’t seem to get their offense going and couldn’t get in close. They took a lot of shots from way out and with lots of time left on the shot clock, and many of those shots hit Cosmo square in the chest. After the Bandits took the lead midway through the third, both goalies stepped up their games but the Rock managed to tie it twice in the 4th before we headed to OT. OT only lasted a couple of minutes, but both teams had some good chances to end it. Brandon Miller and Anthony Cosmo both stood tall, as they had all game. But Brett Hickey managed to get one past Cosmo a couple of minutes in to send the crowd home happy. The Rock and fans celebrated the goal while the refs went to review it and we thought about how deflated the crowd would be if they came out and waved it off. There was even a Bandits player who got himself set up at the restraining line. He looked like he was getting ready for the ensuing face-off – which was weird because if the goal didn’t count, there wouldn’t have been a face-off anyway. I really don’t know if there was bad blood during the handshakes on this night too but the refs were ready for it. The teams went through the line and I paid special attention to Troy Cordingley, who simply shook everyone’s hand. When he got to the Rock coaches, it looked like he gave Lovell a sincere handshake and even patted Dan Ladouceur on the chest. But then the refs came running over. I don’t know if words were said that made them think something was going to happen, or if they just saw the coaches together and thought something might happen, but nothing did. As I said, we had two entertaining games between these two teams, as we frequently do. I like a chippy game with lots of hitting as much as anyone, but the second half of Saturday’s game was great because it had none of that. There was the potential for it to turn into a bench-clearing brawl, but instead we had some great goaltending, solid defense, and some nice goals (and some ugly ones too). Next weekend: the Edmonton Rush are in town. This will be another great game. 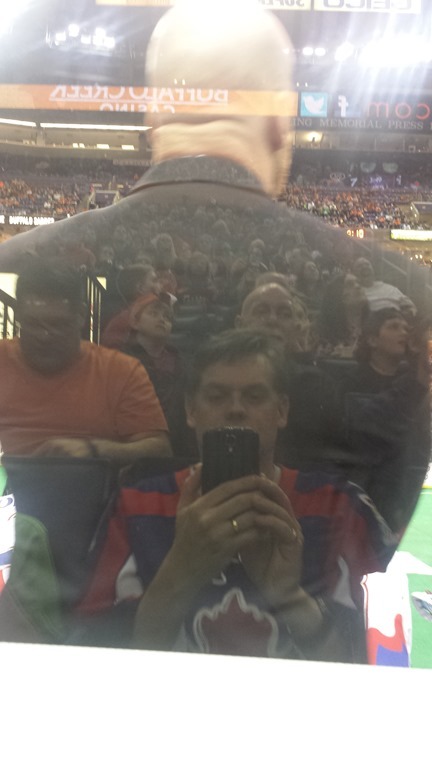 This entry was posted in Buffalo Bandits, Game Review, Toronto Rock. Bookmark the permalink.